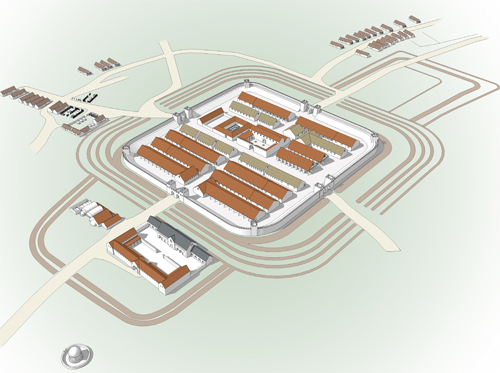 A project examining aspects of Roman military sites in Gwynedd was set up in 2000. The first three years of the project examined fort environs and succeeded in recovering much new information about vici and other extra-mural development. This has allowed better management of the sites and provided a greater appreciation of the extent of archaeological remains around the forts. In 2002 the project was expanded to examine the Roman military road network. This comprised the collation of the extensive and diverse corpus of available data and the mapping of the resulting road alignments as linear files in a GIS programme. A comparative walk over study and condition survey of the extant lengths of road was subsequently carried out allowing scheduling recommendations to be made. An illustrative panel was prepared by GAT to interpret the results of David Hopewell and John Burman’s detailed geophysical survey at Cefn Caer Pennal - one of the forts and vici at which significant new information was obtained and which will inform the revision of the forthcoming new edition of ‘The Roman Frontier in Wales’. The illustration, a diagrammatic reconstruction of the geophysical evidence, is an extract from the full panel. Many thanks are owed to Mr Elfyn Rowlands of Cefn Caer, for his enthusiastic support of the project. Research by Hugh Toller revealed previously unknown lengths of possible extant road between Brithdir and Pennal. These lengths of road are part of Road RRX96, a series of routes running to the west of Cader Idris proposed by Jones (1959) St. Joseph (1961) and Bowen and Gresham (1967). A 12.8km length of the Ffordd Ddu, a multiperiod route on an alignment through Llanegryn, was examined. Several phases of well engineered road were identified, one of which clearly predates the turnpike. The form and scale of the early phase suggest that it could well be the remains of a Roman road although interpretation as an early phase of turnpike cannot be dismissed. A Roman road on this alignment would add weight to suggestions of a Roman building at Peniarth. A further length of road descending from the uplands to the west of Pennal was examined but was found to be a medieval packhorse trail. The final length of road to be examined during the walk-over survey was part of RR68 between Tomen y Mur and Caer Gai, on the east side of Cwm Prysor. A previously unrecorded well-engineered 5m wide road, including a zigzag, was identified. This links the descent from Doldinas to the uplands at Moel y Slates. An almost unbroken length of 14km of extant Roman road has now been identified running between Tomen-y-mur and Fridd Trawscoed. An exceptionally well preserved length of the Roman road between Canovium and Tomen y Mur (road RR69a) was discovered during the walk-over survey, buried beneath 0.6m of peat, in the remote uplands at the head of Cwm Penamnen. A trial trench was excavated across the road in order to assess its level of preservation and a comprehensive programme of environmental sampling was carried out by Astrid Castledine. The road was found to be 5m wide with a foundation of slate slabs laid directly onto peat. The running surface was a layer of gravel and clay. A wooden surveyor’s peg was found alongside one edge of the road. The road was in perfect condition, and showed few signs of erosion suggesting that it was abandoned after the Roman occupation. Radiocarbon dates from the peat above and below the road confirmed its Roman date. Intensive probing traced the exact course of the road for 1km between the eastern side of Cwm Penamnen and the slopes above Cwt-y-Bugail quarry. A report was produced and the findings will be published upon completion of the environmental analysis by Astrid Castledine. A trial excavation was carried out in order to investigate the defences of the fort at Llanfor. It was hoped that the excavation could produce dating evidence for the site and allow an assessment of the level of preservation of the archaeological resource and potential threats to the monument. The earliest feature identified in the excavation was the shallow ditch of the large marching camp standing to the north of the fort. This was cut by the outer of the three ditches defending the fort. The inner was found to be the main defensive ditch. This was V shaped, 1.7m deep and 1.9 m wide. The outer two ditches were 0.8m deep and would have presented lesser obstacles. The rampart was about 8m wide and turf faced. Several sherds of pottery were recovered from the excavation but none were closely datable. The finds would however not have been out of place in an early Flavian context.